. . . One saw family after nuclear family marching for the peace of mind that a world without ice raids would bring. Brown men and women in suits went by waving old glory......mechanics, in their dirty work clothes, jumped into the march, sign in hand while old farmers and field folks marched in the hot sun. ..... again. Grandmothers, toddlers, Korean families, middle aged managers, old artisans, women wearing their hajibs and of course those good capitalist's earning money off the selling of flags and their co-products all strode down Broadway displaying strong arguments for fair treatment, human empathy and neighborliness. Themes such as citizenship and inclusion, the sanctity of the nuclear family, and the inhumane effect of deportation on a family permeated the rally as well as a call to stop the needless deaths that can occur at difficult or long border crossings. 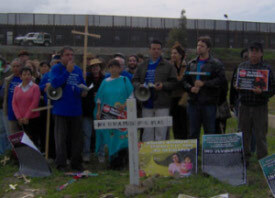 Viernes, el 26 de junio 2009 � RANCHO CUCAMONGA � La red de Justicia por los Inmigrantes, atenta a la ola de redadas de la patrulla fronteriza, estuvo presente en la esquina de los jornaleros (Arrow y Grove) en la ciudad de Rancho Cucamonga. Nos mobilizamos para estar presente en caso de cualquier abuso de los derechos de los jornaleros y para documentar cualquier enfrentamiento. Friday, June 26, 2009 � RANCHO CUCAMONGA � The Inland Empire Justice for Immigrants network, aware of the increased presence of immigration enforcement, was present for a Border Patrol raid on the Rancho Cucamonga day labor corner at Arrow and Grove. We mobilized instantly to be present in case in human rights abuses occurred in order to document them. Most of the normal day laborers were not present, but a few were there. Enrique Morones launches new caravan movement to raise awareness of humanitarian tragedies along the US-Mexico border. (LOS ANGELES) Immigration activist Roberto Lovato was there when the Los Angeles Police Department launched its brutal assault on a park full of migrant families with children last week in LA, and this is what he saw and understood. "I saw the LAPD," he wrote "dragging the immigrants and the entire country into dangerous terrain, a new threshold in the immigration war raging around the country." What he saw was more than an Iraq-style surge; this was an all out escalation, a new strategic plateau in the U.S. government�s War on Migrants. 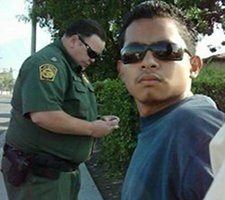 Javier Rodriguez, an immigration activist with L.A�s March 25th Coalition, called it a "political decision" to "dismantle this [immigrant rights] movement." Last year, in 2006, millions of migrant and their allies � their familia � took the streets, giving birth to the most powerful mass movement in the U.S. since the Civil Rights and Black Power movements of the 1960s and 70s. The new movement stunned the US ruling class, drove the deepest of wedges straight into the heart of a seemingly unstoppable neo�con drive toward fascism, exposed the essential brutality and racism at the core of the Republican, neo�con agenda, began the public unraveling of the Bush regime, and opened the door to the stunning exposure, repudiation and defeat of the neo-cons in the House and Senate, who had led the racist charge to make felons of all undocumented migrants � and of anyone who so much as gave a ride to someone undocumented. And like their counterparts in the 60s era, the reactionaries of today saw the unmistakable outlines of the threat presented by brown resistance to their power and their drive toward a fascistic state. Like the reactionaries of that era, they moved to kill the movement with mass arrests and state intimidation. Only this time, it wasn�t the FBI, COINTELPRO, the murders or imprisonment of Black leaders, or the mass incarceration of Black and other peoples of color that the State relied on. This time, it was the department of Homeland Security, ICE, and a strategy of direct vengeance � the deliberate terrorization of the millions who had taken the streets and who had precipitated the collapse of the neo-fascist juggernaut. From the newswire: IMMIGRATION DEBATES UP IN THE US SENATE, NEW SANCTUARY MOVEMENT LAUNCHED IN THE U.S. by AJLPP | | AJLPP / CDIR Rejects New Immigration Proposals as Anti-Immigrant, Anti- Family Reunificat by Coalition In Defense of Immigrant Rights .